-- Gary Futrell of York Gary Autoplex in Nashville, Ark., is the new chairman of the Arkansas Automobile Dealers Association. Also elected were Avis Bailey of Superior Nissan in Fayetteville, vice chairman; and Jim Ross of Ross Ford-Toyota in Wynne, treasurer. Members of the Lovegreen family of Lovegreen Motor Co. in Palmyra, Mo., receive a 75-year award for Ford. Pictured, from left, are Bill Lovegreen; Marjorie Lovegreen; James Lovegreen; Bob Bremer, Ford division's Kansas City regional sales and service manager; Stephen Lovegreen; and Robert Lovegreen. 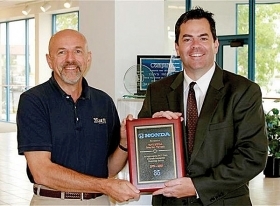 Bill Vander Perren, left, of Van's Honda in Green Bay, Wis., receives a 35-year award for Honda from Thomas Bice, American Honda Motor Co. senior district sales manager for Wisconsin. 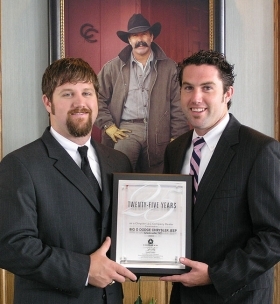 Jake Odum, left, and Kyle Odum of Big O Dodge-Chrysler-Jeep in Greenville, S.C., received a 25-year award for Dodge from Chrysler Group. Jake Odum is president; Kyle Odum is sales manager. 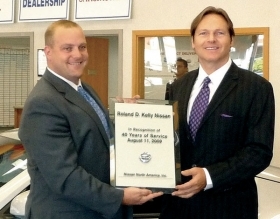 Brian Kelly, right, of Roland D. Kelly Nissan in Beverly, Mass., receives a 40-year award for Nissan from Chad Filiault, Nissan North America's Northeast regional dealer operations manager.